Magnolia x soulangeana is commonly known as the Saucer Magnolia and is also known by some as the Tulip Magnolia. It is a deciduous hybrid magnolia that is a landscape show-stopper. The stunning cup-shaped blossoms open from late February to April, with some blossoms reappearing throughout the summer months and even into winter. The saucer magnolia is hardy to Zones 4–9 and does especially well in our Mid-Atlantic region. It grows to a height of 20 to 30 feet, but it can be trained as either a shrub, a small tree with multiple stems, or a single-trunk tree. Plant it in full sun for best flowering results. It can take most all soils conditions. It has some drought –and pollution-tolerance. It does need some protection in areas with cold winters for the first couple of years. The only drawback to this early season tree is that a late frost can sometimes impact the flowers and cause them to brown and drop off prematurely. It is related to our native Southern Magnolia and was first cultivated in 1826. 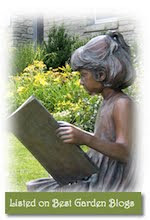 New introductions include the “Little Girl series” from the U.S. National Arboretum. In my own garden, I have ‘Jane’, which has dark pink exterior and white interior. My favorite grove of Saucer Magnolias is at the Enid Haupt garden at the Smithsonian in Washington, DC. The trees line the main formal garden and put on a show that rivals the famous Tidal Basin Cherry Blossoms. It is the perfect spot to enjoy lunch outdoors on an early spring day. Deer-resistant, sweet smelling, tough, and long-lasting, Daffodils are a wonderful spring-blooming bulb to add to your garden. Plant them each fall at a depth of about two-times the bulb’s size. Then forget all about them until the foliage and flowers emerge the following spring. You can get varieties that bloom in early-season (February), mid-season (March) and late-season (April). Be sure to check the bulb bag labels and catalog descriptions, so you can have flowers all throughout spring. The only maintenance they ever need is to dig and divide them every 10 years or so, if they get too crowded and their flowering slows down. Shown here are some of my favorite varieties. The ‘Tete-a-Tete’ is a dwarf daffodil that has multiple blooms on a single stem. They are only 6-inches high and are terrific grouped on a slope or alongside a pathway. The ‘February Gold’ is a classic yellow daffodil that is the first to bloom in my garden. I love to cut it and enjoy it inside. One warning, if you bring them in as a cut-flower, do not mix them with other flowers, as they exude a toxin into the vase water that causes the other blooms to droop. Another favorite is ‘Ice Follies’, It is a classic bi-colored daffodil with large flower cups. It ranks third in the Top Ten Daffodils produced worldwide. Including hybrids, there are over 13,000 distinct daffodil varieties in existence. You are sure to find a few favorites of your own. The March 2018 issue of Washington Gardener Magazine is now out. In my garden, I have Winter Jasmine and Forsythia blooming at the same time, which is weird and confusing. The flowers on the Heather and Hellebores are right on time. Early bulbs are having a nice, long run due to the chilly temps -- Snowdrops, Crocus, Iris reticulata, Syberian Squill, Winter Aconite, and early-season Daffodils like 'Tete-a-Tete' -- are all putting on a pretty show. The Violas I had hoped would winter over all disappeared after the polar vortex freezes, I plan to replace them with a new batch as soon as I can get to a local garden center. The Lenten Rose (Helleborus orientalis) blooms in late winter into early spring. It is a tough plant that is drought-tolerant, thrives in shade, and is deer-resistant. If it is happy in a spot, it will soon form a nice colony to become a virtual ground cover. The large leaves are evergreen and resemble our native Mayapples. The Hellebore flower is stunning and the latest breeding introductions are spectacular. My friend, Barry Glick, the self-proclaimed Hellebore King, grows amazing hybrids. Among them are beautiful doubles and picotees that I covet. These are very low-maintenance plants. In mid-winter, I gently remove any fallen leaves from around the Hellebores to be able to enjoy the blooms when they start to emerge in the bleakest months of the year. The only other attention they ever need is to cut back the old, tattered foliage in early spring, if it bothers you. The Hellebore is a popular cut flower in Europe. The flowers on this hardy plant are lovely floated in a bowl of water. I have had them last that way for over a month indoors. It is so nice to be able to enjoy them inside, when bad weather prevents you from going out into the garden. The U.S. Botanic Garden (USBG) presents Orchid Spectrum running through April 8, 2018. This annual orchid exhibit, in partnership with Smithsonian Gardens, highlights the world's largest plant family and the USBG's most extensive plant collection. View more photos from the exhibit here on our Facebook page. Crocus lawns are popping up all over the Washington, DC, region. They look so enchanting and romantic. They must be a lot of work, right? Wrong! To get one of your own, start with a turf grass lawn -- the thinner and more shade-challenged the lawn is, the better. A thick, lustrous lawn does not allow for many of the bulbs to emerge and succeed. The best bulbs to use are the ‘Tommy’ Crocus (Crocus tommasinianus) straight species. They are tiny bulbs (just a few centimeters across). They can naturalize and spread by seed. The ‘Snow’ Crocus (C. chrysanthus) is another option, though they are not as prolific nor as squirrel-proof as the Tommies. The traditional crocus (C. vernus types) are not suitable for this application as they too large and come up too late in the season. Mark your calendars for this October/November. Buy at least 100 of the Tommy Crocus bulbs at a local garden center. Or place your order this spring with a mail-order bulb company to guarantee the best selection -- Tommy Crocus often sell out fast. I find a long, thin dandelion weeder is the ideal tool for planting these tiny bulbs. 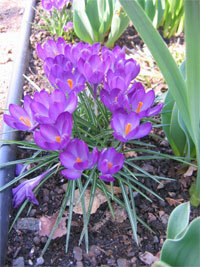 You can even do double-duty by pulling out a weed and sticking in a few crocus bulbs in that same hole. Next, sit back all winter. Finally, enjoy the show the following March! Now here is the real key: Do NOT mow in the spring until the crocus blossoms and foliage have died back on their own. If you mow too early and cut off the foliage, you are cutting off their food and they won't come back well for you in future years and what you want is for them to not only come back, but also to multiply. If you simply have to mow, set your mower at the highest setting possible (3" is ideal), so you are higher than most of the crocus foliage. Another precaution, if you irrigate your lawn, this will not work. Bulbs need premium drainage and cannot stand to be in constantly wet soil. They will rot. Also, don’t use weed-killers. Don’t fertilize. Don’t aerate. Basically, be lazy and your crocus will multiply. 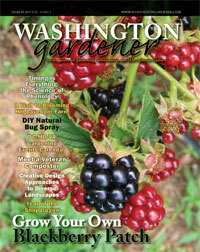 The video was produced by Washington Gardener Magazine and photographed/edited by intern Allison O'Reilly. There is an optical illusion to these gorgeous succulent containers. The trick is that there is a smaller glass container inside the larger one. The smaller one holds the plants and soil. 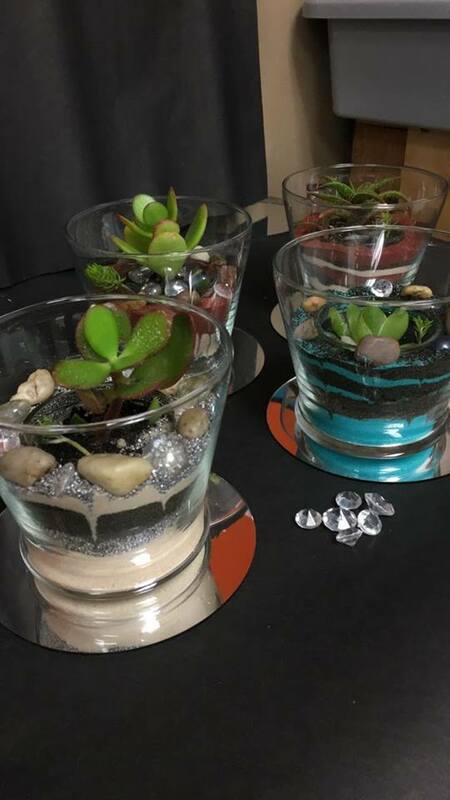 This allows you to water the plant and not moisten and ruin the layers of decorative sand around it. 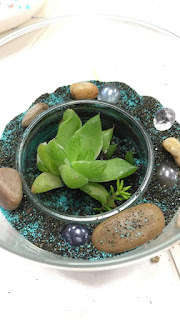 By the way, these succulents in sand are not true "terrariums," but because we are planting in glass, they are called that anyway. 1. Pot up your succulent(s) in the cactus mix. Water them in lightly and press the soil firmly. Make sure the succulent is sitting "high" up and the soil comes to just below the lass rim. 2. Center the small jar with succulent potted up in it inside the larger glass vase. 3. Take a stiff piece of paper and form a loose funnel to cover the inner jar and then take a spoon to gently add in layers of sound between the small jar and the outer edge of the vase. Go slowly and carefully -- working a little at a time and checking the effect as you go. It is much easier to add than to subtract! If you get any stray sand in your soil, use a skewer to mix it further down into the soil and it will blend in. 4. Once the sand is level with the inner jar. You can add decorative elements around it. Shiny rocks and gems are fun or you can go more natural with river rocks and pebbles. Place your succulent in a bright sunny window and water a few drops at a time with a small syringe just onto the soil around the plant. Once the plant starts to out-grow its spot, you can pull it out gently and re-pot with another one. 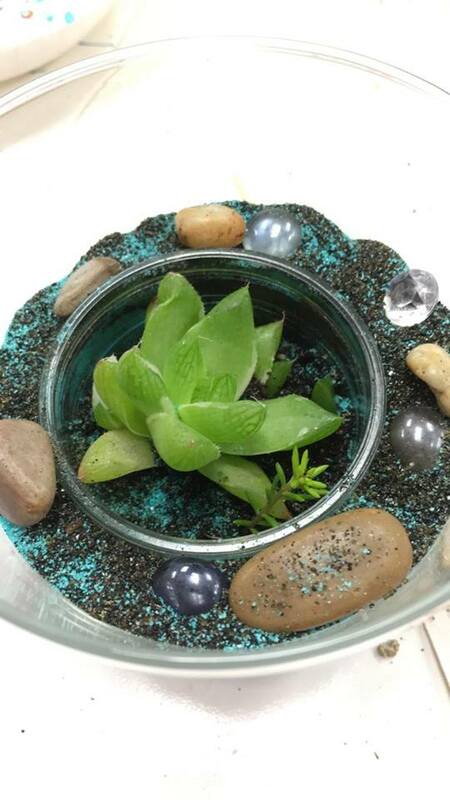 or you can totally disassemble the terrarium and start over again.